Where to begin? The entire process of this Hundred Hole Hike has been incredible. First of all, thanks to Jim Colton for putting the "event" together. Over $250,000 will be donated to various charities all over the country as a result of the Hundred Hole Hike. Great job, Jim! Next, thanks to all of my caddies and volunteers...Brian Finn, Heidi Voss, Chad Kellogg, Jason Bucci and of course, my lovely wife, Kristi and my Mom and Dad. Without you, there's no way this could have been completed! Thanks to Todd and Heidi Voss and the Double Eagle Club for the hospitality. They set me up to succeed and truly went above and beyond! Finally, thanks to everyone who pledged financial support through my Hike. As a result, the Wee One Foundation will receive over $7,200! This money will truly make a difference! For those that pledged, you will receive an email from me in the near future on how to fulfill. If you did not, there's still time! Click Pledge Now on this web page and make a difference today! We did it! 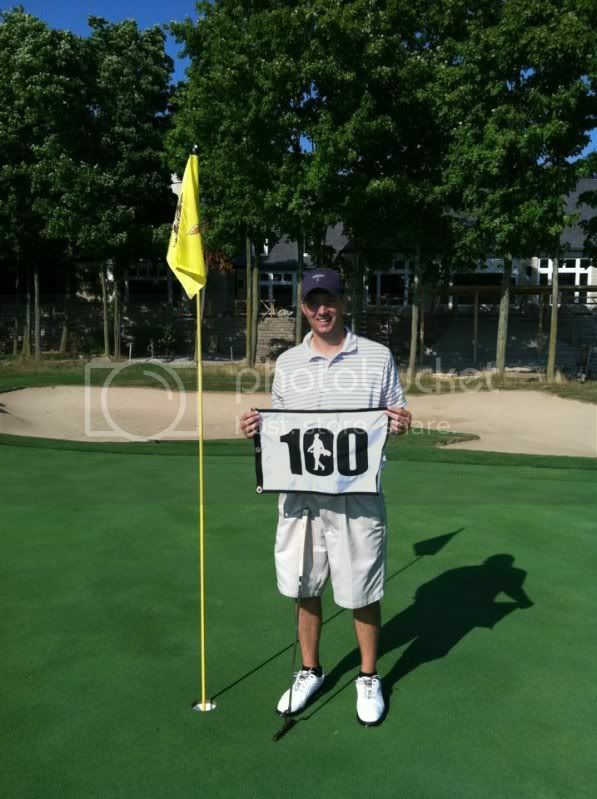 With the help of friends and family, I completed 108 holes on Monday, July 23rd at the Double Eagle Club. It sure wasn't easy, though! A bit of doubt crept into my head the days before the Hike. Reading the posts from other hikers saying how difficult this was just fueled the fear! On top of the mental fear, on Sunday an old knee injury started to rear its ugly head. We were off to a great pace in the morning...the first three rounds were each played in 1:50 or less! A short lunch break and back out for the fourth round which took a little over 2 hours. This is the round when the knees started to give out! I broke my back in high school, which was quite painful...I can't even begin to describe the pain experienced in my knees on Monday! After about 90 holes, I was really questioning whether or not 108 was feasible. 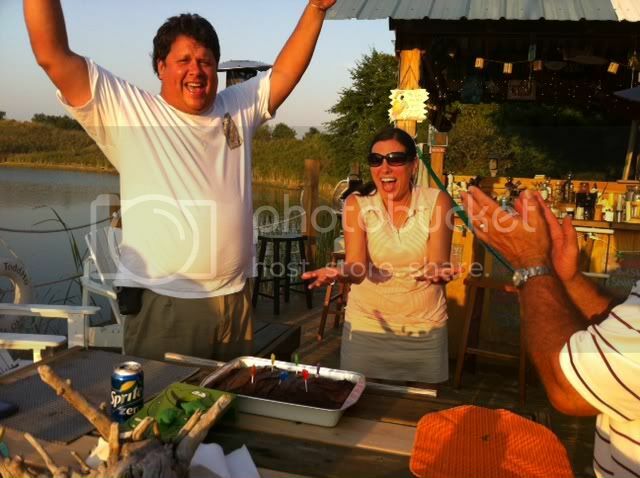 Fortunately, my friends and family were there to lighten the mood and provide encouragement to accomplish the goal. There was plenty of daylight to keep going, but my body was ready to shut down...so we stopped at 108! I could write an essay on this experience...but I'll save you some time and just go with some of the highlights (and low-lights)! First tee shot was struck at 5:50 am...had to play by feel for the first 2 holes. Fortunately, we were able to find all of the shots and kept a strong pace playing the first 38 in 3:40. The Bye hole. Double Eagle has a great little feature...the Bye hole. It's a short par three which can be played after the 9th or 18th. I played it after the 18th in each of my rounds...it was a great addition to the Hike! Even though I played it very poorly, it was a great use of time going from the 18th green to the 1st tee. Almost two aces! During my 4th round, my ball mark was one inch from the hole...the shot never left the pin, landed right in front and hit the stick, finishing just a few feet away. On my 105th hole of the day on the par 3 - 13th, I hit a nice little gap wedge that was tracking and my ball mark was no more than three inches from the hole. Poor putting. I missed both birdie putts on the near aces mentioned above! Before heading out, Todd recommended playing half the break that I thought would be in the putts. Even with that knowledge...I missed pretty much everything I looked at, all day! Most of the putts were pulled to the left...you'd think I would have figured that out after the first 54 holes maybe!? Too many lost balls and too much sand! That about says it all...I think I went through at least 7 balls and probably hit into a bunker 5 times per round. That didn't help pace of play or the score! GREAT BIRTHDAY CELEBRATION! My wife was kind enough to let me do this on her birthday! Following the round, we had a great celebration at the tiki bar nearby in which our gracious hosts provided us with an amazing meal!